It is widely-known that one of the meanest, yet most effective, ways of taking revenge on someone for an injustice is by poisoning them. Throughout history countless numbers of important and unimportant people have been killed with poison. So great was the fear of being poisoned that the kings and queens of Great Britain employed “beefeaters” to taste their food for them in case it had been tampered with. Indeed, even today poisoning continues – only last year there was a famous case of a Russian journalist having been fed a radioactive substance at a sushi restaurant in London which killed him a few days later. I bring this subject up, not to highlight again that we had badly upset stomachs during our trip to England, as my wife discussed this at extensive length below, but rather as a roundabout kind of way of introducing an anecdote, which in turn introduces a recipe. You see, at my office we are made/encouraged to bring food to our Christmas party (why this is the case is quite another story altogether), and last year I brought along a black bean dip. This bean dip was a great success with even the president of the company telling me how good he thought it was. Among the other admirers was my boss at the time, who I had never seen eye to eye with. (Subsequently, he has left the company but I should say that it had nothing to do with my bean dip.) But, in telling me how much he liked it (about the only thing I’d done until that point that he had liked) he asked me whether it contained any meat as he was a strict vegetarian and couldn’t stand to eat any flesh. Smiling, I reassured him that it contained no meat or meat products of any kind and that he should go ahead and eat all he could. I took great joy in the, admittedly very petty, trick I had played on him as he tucked in and scraped the bowl clean. My bean dip, of course, contains chorizo and ham or chicken stock, and half of the joy of watching my boss eat the dip was the seeing him wolf down small cubes of chorizo without so much as a pause to think about why a bean dip should contain something reddish-brown, chewy, smoky and most definitely porky in taste. 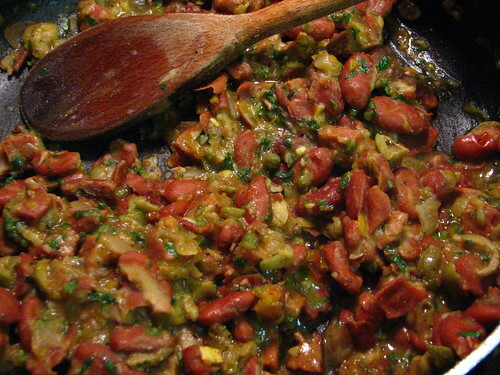 The advantage of having chorizo in the beans though, is that it provides the porky flavor that gives the often plain tasting bean something to shout about. So, if you like porky, cumin flavored black beans (and this recipe works just as well for pinto and red beans providing you give them a quick mash at the end) hot or cold, as a side dish or a dip, then check out the recipe below. It goes especially well with the pork chops with lime and olives, but only really if you substitute the yucca for rice, otherwise it can get a bit thick on your palate. Otherwise, this side dish is great with other Latino-inspired dishes. We use it often as a side to soft tacos, burritos and shredded chicken sopes. Get creative. Saute onions until softened. Add chorizo and allow to release its delicious orange fat. Add garlic and hot pepper and allow to saute. Throw in beans and allow flavors to mix before adding in dry spices. Stir. Add roughly half the stock and turn heat to medium. Simmer beans for about 20-25 mins and adding more stock whenever you can see the beans. At about the twenty minute mark, taste beans and if soft, you’re ready. If still a bit chewy, cook until soft. Add chopped cilantro and lime juice. Mash beans a bit if red or pinto, but not if black. When you don’t eat meat for a long time, your body doesn’t produce the enzymes required to digest it. Your boss might have gone home with diarrhea that night. Why would you take pleasure in lying to someone like that? How violating. @Jonna: if a little diarrhea was the worst that happened to him, my conscience is pretty clear. ← Corporate Food Co’s in EU Will Stop Advertising Junk Food – Why is America Always Last to Do Everything?